Temple Lodging in Japan "Hongaku-in"
They serve shojin vegetarian cuisine. 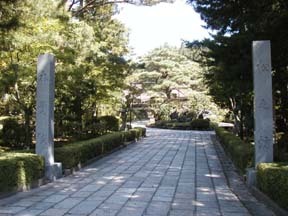 There are four gardens including a stone garden with a moss arrangement and a garden with a pond, etc. You can enjoy the beautiful scenery. People traveling alone or traveling with a pet can be accommodated. They have facilities for handling wheel chairs. In the long history of this shukubo, Tanyu Kano stayed here during the Edo period. When I arrived, a priest was relaxing in a T-shirt and another priest went out wearing samue (working clothes for monks), which gave me the impression that it was rather like a private house offering room and board. Also, the office was not very organized. Therefore, I felt worried at first. However, inside the shukubo, the corridor and the washbasins were all clean. I had to pass the office to go to take a bath, so a woman traveling alone may not like it. I felt it was difficult to refuse the prayer in the morning service, which they said was usually 3,000 yen. I thought this would be a rare occasion, so I asked for it. I was able to eat the shojin vegetarian cuisine while relaxing in my room. Although the tempura was not hot, everything was very tasty. The volume was more than satisfactory. The taste was rather thick, unexpectedly. The fee was a little more than 15,000 yen plus 3,000 yen for the prayer fee. The priests were all nice and I was able to enjoy a comfortable stay.